ccs-garden.org is a resource site for the Cornerstone Christian Schools Student Garden project. The banner photo (above) shows six of the raised garden beds in the CCS Student Garden on May 13, 2013. The garden consists of seven raised beds and several non-raised beds occupying a 140-foot long strip along the northwest corner of the Camarillo Christian Church property. Partially visible in the banner photo, four planter barrels line the edge of the patio and are part of the garden. See photo below and garden layout. The seven raised beds with concrete-block walls were constructed in two phases: in April 2012 and April 2013. Underground plumbing to garden water faucets was installed May 2013. There is a 36" wide walking path around each raised garden bed. The garden is maintained 52 weeks a year with students doing most of the work. With adult guidance, students prepare soil for planting, plant, weed, water and harvest edible crops. Each bed is planted by the students of one of the elementary school classes. The blue flag identifies the class that planted that bed. The garden is planted with sunflowers, tomatoes, corn, cucumber, beans, squash, lettuce, carrots, onions, artichoke, strawberries, eggplant, beets, broccoli, bell pepper, watermelon, pumpkin and a selection of herbs. The apple tree and plum tree (located at the southwest end of the garden) and the compost bin now located at the northeast end of the garden are not visible in the banner photo. Students participated in the construction of the seven raised garden beds in April 2012 and April 2013 by digging the holes for the recessed raised beds, then shoveling dirt and compost to fill the beds. Since May 2012, following construction of the first three raised garden beds, CCS students have participated in growing vegetables, fruits and beneficial flowers. Students have planted seeds and small plants, watered, pulled weeds and harvested. Students also load the compost bin with plants that have been removed from the garden beds. In the winter, in preparation for spring planing, compost is removed from the bin and applied to the garden beds along with composted steer manure. Students learn to use garden tools such as shovels and hoes. They also use measuring devices such as the soil moisture meter and the compost bin thermometer. Mr. Sandy shows grade 4 students how the borage plant attracts honey bees to the garden (2013). 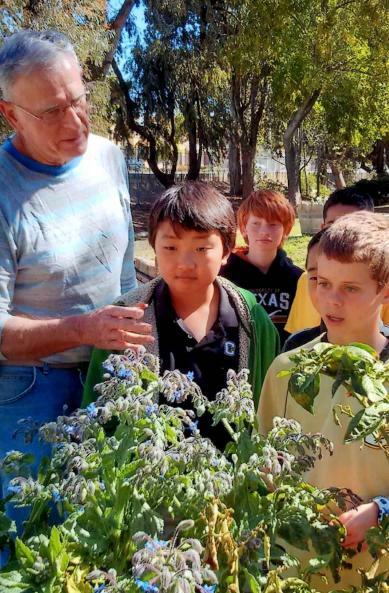 The CCS Student Garden project is part of the curriculum of Cornerstone Christian Schools, Camarillo, California. 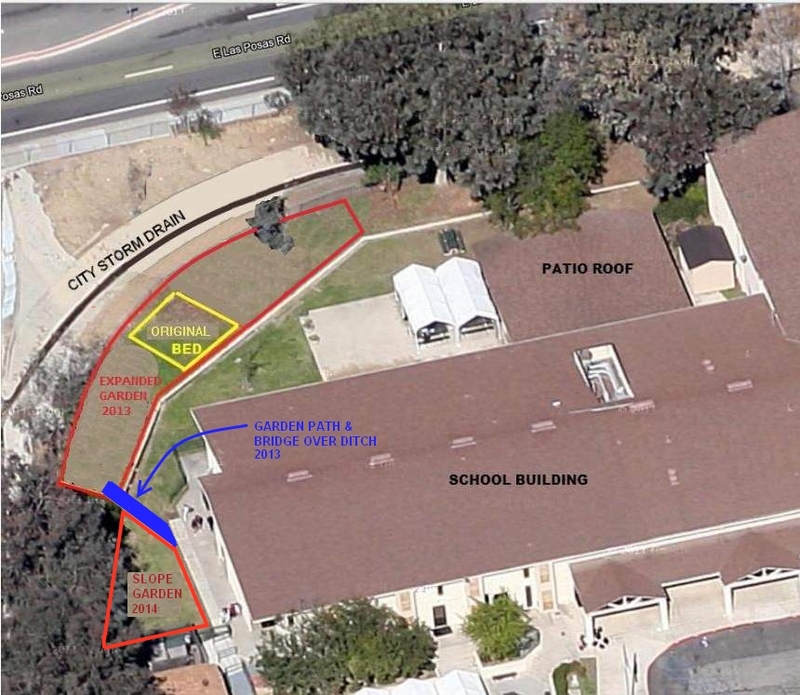 The school and the garden are located on the property of Camarillo Christian Church. The goal of the CCS Student Garden project is to provide a year-round agriculture lab that can be used for teaching science, mathematics and social studies in grades K-8. We hope that our program instills in the students (1) an appreciation that God created plants to be our partners in life on Earth and (2) a desire to develop skills in growing their own food organically. Although the CCS has had a garden plot for many years, the original 17'x17' garden (identified as Original Bed on the aerial view below) was expanded by school volunteers in 2012 and 2013 (identified below as Expanded Garden 2013) to provide the seven raised garden beds used by CCS teachers in their K-8 science classes. The Garden Club students meet twice a week after school with their adviser to provide year-round maintenance of the CCS Student Garden. The CCS Garden is administered by the the Principal, Cornerstone Christian Schools. This school year Mr. Sandy is the garden coordinator and Garden Club adviser. Apr 21, 2012. First Garden workday - move blocks and soil amendment, excavate garden bed areas and construct three raised beds. Aug 11, 2012. Four overhanging trees removed from the right side of the garden. Overhanging branches were removed from two other trees. fill garden beds with compost and soil. Apr 2013 - Kinder through grade 5 classes come to the garden to plant vegetable seeds and seedlings donated by Green Thumb Nursery, Ventura and Lowes, Oxnard, assisted by Mr and Mrs Sandy. Aug 2013 - The Garden Club was formed as a school-sanctioned after-school activity supervised by the Garden Club Advisor, Mr. Sandy. Mar 5 - Apr 2, 2014 - Kinder through grade 5 classes come to the garden to plant vegetable seeds and seedlings donated by Green Thumb Nursery, Ventura. Apr 2014 - Created the new "slope" garden at the west end of the school building. Garden club students planted squash seedlings as well as pumpkin and cucumber seeds. Mr. Sandy installed the drip watering system and the cucumber trellis. This area is very challenging for plants due to minimal direct sun, gophers, squirrels and rabbits. We will experiment to determine which plants grow well in this area. Jul 2015 - The dirt path from the bridge to the school concrete walkway was paved with donated concrete paver blocks. Mar-Apr 2016 - Two more raised garden beds were constructed in areas previously used for occasional planting. We now have nine raised beds that protect plants from gophers and eucalyptus root incursion. A concrete block retaining wall was constructed on the south side of the artichoke bed. Photo below from Google maps has been annotated to indicate the garden, patio and buildings. It shows the extents of the original garden before 2012, the expanded garden in 2013 and the slope garden planted in 2014. The 2013 expanded garden is approximately 140 feet long. A chain-link fence separates the northwest edge of the garden from a large city storm drain concrete channel. The southeast edge of the garden is bounded by a small concrete V-ditch surface drain. A path from the west end of the building into the garden via a bridge over the v-ditch was constructed in 2013. See Garden Layout page for garden design details. The ccs-garden.org website is maintained by Elden Sandy, esandy@ccsed.org. Site updated March 16, 2017..